Home Other Articles Cosmic Dust: What Is Cosmic Dust? Cosmic dust is a type of dust composed of particles in space which are a few molecules to 0.1 mm in size. 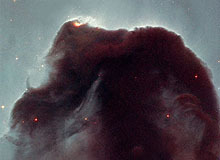 Cosmic dust can be further distinguished by its astronomical location; for example: intergalactic dust, interstellar dust, interplanetary dust (such as in the zodiacal cloud) and circumplanetary dust (such as in a planetary ring). In our own Solar System, interplanetary dust causes the zodiacal light. Sources include comet dust, asteroidal dust, dust from the Kuiper belt, and interstellar dust passing through our solar system. The terminology has no specific application for describing materials found on the planet Earth, other than in the most general sense that all elements with an atomic mass higher than hydrogen are believed to be formed in the core of stars via stellar nucleosynthesis and supernova nucleosynthesis events. As such, all elements that exist can be indiscriminately considered to be a form of "cosmic dust".